Authorities on Wednesday identified a man whose body was found in the dry riverbed of the Los Angeles River in the Los Feliz area. The discovery was made at 12:40 p.m. Tuesday near the 3200 block of Hyperion Avenue, said Brian Humphrey of the Los Angeles Fire Department. The man was identified by the coroner’s office as Jose Tejada, 27, of Los Angeles. An autopsy was pending. Three development team bids selected as finalists to restore and adapt the graffiti-covered city-owned Lincoln Heights Jail for a new use will get their first public airing during a meeting Thursday at the Goodwill Industries Auditorium in Lincoln Heights. The meeting starts at 6:30 p.m. 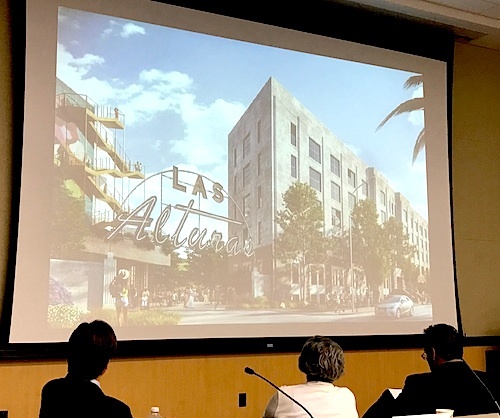 The top three development teams – selected through the City of Los Angeles’ formal Request for Proposal (RFP) process – will present their proposals to a Community Advisory Panel appointed by the councilman for the area, Gil Cedillo. The panel is “comprised of diverse stakeholders representing the Lincoln Heights community and public sector,” according to an email from the councilman’s office. The public will be able to ask questions and submit comments at the meeting, which the advisory panel will use to make its final selection, according to Cedillo’s office. The city stopped using the facility as a jail in 1965, eventually making it available to house non-profit groups, including the Bilingual Foundation of the Arts (BFA) and Lincoln Height Boxing Gym. But the years have were not kind to the facility and it fell into serious disrepair. Besides the graffiti, there is lead and asbestos and potentially other contaminants in the building and surrounding land. The city permanently closed the facility in 2014, but is now hoping to breathe new life into the facility through its bidding process. “A City technical panel comprised of city department representatives vetted the proposals based on RFP scoring criteria, and has identified the top three proposals,” according to the email from Cedillo’s office, which identified CIM Group, Lincoln Property Company and WORKS (Women Organizing Resources Knowledge and Services) as the three top development teams. While the councilman’s office said they were unable to oblige EGP’s request to review the proposals ahead of Thursday’s meeting, they did say the “three proposals offer a different mix of uses for the jail property – including live-work units, commercial retail space, creative office, a mix of market-rate and affordable housing,” and put the private investment to be made in the multi-million dollar range. Goodwill Industries Auditorium is located at 342 N. San Fernando Rd, Los Angeles 90031. For more information, contact CD1 Senior Planning Deputy Guy Gubatan by calling (213) 453-7001 or email him at gerald.gubatan@lacity.org. A body found on an island in the Los Angeles River in Los Feliz was officially identified Tuesday as that of 14-year-old Elias Rodriguez, who had been missing for more than a week. With the body identified, his family established a GoFundMe page in hopes of raising money for funeral and other expenses. The website — http://www.gofundme.com/in-honor-of-our-angel-elias-eli — had raised more than $3,200 as of mid-afternoon Tuesday, with a goal of $10,000. Rodriguez went missing on the afternoon of Feb. 17 after leaving Cesar Chavez Learning Academies in San Fernando during a powerful rainstorm, according to the Los Angeles Police Department. The teen had borrowed someone’s cellphone to call his mother at work before he headed to his grandmother’s house to wait for her, but she missed the call, police said. Authorities sought public help to find him, and Los Angeles police were joined by the FBI in the search. The body was found at 1:15 p.m. Saturday on the island near the Golden State Freeway and Los Feliz Boulevard. According to the coroner’s office, Elias drowned, and his death was ruled accidental. His family members held a news conference Tuesday at the spot where the boy presumably was swept away by a rushing water, and they thanked people who helped look for Elias and supported the family during the ordeal. “During this time, when there is so much political strife in our country, we know that there is so much good in people and we want to continue that kind, caring spirit of love,” Elias’ aunt Jessenia Vega said, adding that the family is still seeking answers they may never get about what exactly happened to their loved one. The family will hold a candlelight vigil for the boy at 7 p.m. Friday. They plan to light the path the boy likely took from Cesar Chavez Learning Academies before he went missing. A one-mile section of a bike path along the Los Angeles River will be closed through November 2019 for construction, L.A.’s department of public works has announced. The closure will impact cyclists using the LA River Bike Path east of Riverside Drive. The entrance to the bike path and the 134 Freeway will be closed, and bike path users will be instructed to exit at Zoo Drive and Western Heritage Way, according to the city. The bike path is within the Riverside Bridge construction zone and the city is closing the path as a safety precaution. The bridge is being widened on the downstream (eastbound) side by 19 feet to make room for 4 more traffic lanes, medians, shoulders and sidewalks. Other improvements include construction of an underpass along the south channel and an additional 400 feet of bike path. A homeless man was shot twice Wednesday morning inside an encampment near the L.A. River, but the victim was not cooperating with authorities, police said. The shooting took place about 12:20 a.m. on Perrino Place, east of the L.A. River near Washington Boulevard, said a desk officer at the Los Angeles Police Department’s Hollenbeck Division. The victim was not being cooperative with police, according to the officer. “He said he didn’t see anything; doesn’t know anything and doesn’t know why he was shot,” the officer added. Anyone with information on this shooting was asked to call the LAPD’s Hollenbeck Division at (323) 342-4100. Tipsters can also call Crime Stoppers at (800) 222-TIPS. All tips can be submitted anonymously. 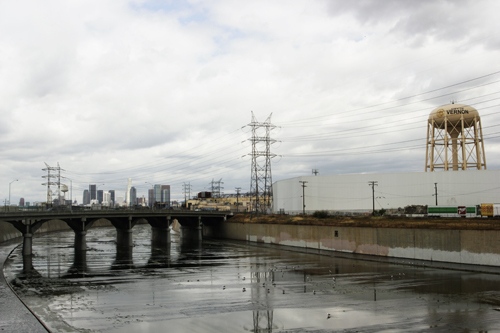 L.A. River: What About the Southeast? Efforts have been in full force to revitalize the Los Angeles River that once ran freely from Los Angeles to Long Beach but is now partially covered by concrete and graffiti. As Mayor Eric Garcetti touted his $1.3 billion plan in Washington D.C. to restore natural elements to an 11-mile stretch of the river between Griffith Park and downtown, legislation has been making its way in Sacramento to address the southern portion of the 51-mile long river. Assemblyman Anthony Rendon represents the 63rd District, which includes Southeast communities along the river: Bell, Cudahy, Hawaiian Gardens, Lakewood, North Long Beach, Lynwood, Maywood, Paramount and South Gate. Rendon hopes his latest bill, AB 530 will allow the communities south of Los Angeles and north of Long Beach to have a voice in developing a plan to restore the river along their borders. “Southeast cities are very dense, lack open area and the river affords the opportunity to create outdoor recreation space for these communities,” says Rendon. In 1996, Los Angeles County adopted a Master Plan for the entire L.A. River. Since then, the City of Los Angeles has developed its own revitalization plan for the upper portion of the river within city limits. In the Southeast, however, revitalization efforts have languished for nearly two decades, going nowhere. “I am very supportive of the efforts to revitalize the upper region of the river but I believe the lower area, through Southeast Los Angeles County deserves some consideration,” Rendon told EGP. Mark Lopez, director of East Yard Communities says large cities like Los Angeles and Long Beach have larger, more sophisticated staff to move their agendas forward, which is not the case in smaller Southeast communities. Rendon’s legislation urges state representatives to update the Master Plan in order to focus attention and resources to the lower portion of the river. This month, AB 530 was unanimously approved by Assembly and is expected to go before the State Senate next month. This legislation will start a much-needed dialogue, Rendon said. “People in these communities are very interested in revitalizing the river beyond Boyle Heights,” he said. Though no direct funding is attached to the bill, Rendon’s District Director Raul Alvarez told EGP that the group in charge of the revitalization plan would be eligible to apply for funds from Proposition 1, a 2014 voter-approved water bond – authored by Rendon – that allocated $100 million for an L.A. River study. Alvarez said the hope is that the group would apply for the funds to pay for needed studies and outreach. Rendon’s staff began talking to the community about plans for the river during a bike ride in Cudahy organized earlier this year by the Los Angeles County Bike Coalition. Residents expressed a need to connect biking paths in the region; with the L.A. River being the place to do it, Rendon said. “The L.A. River is a natural resource that all communities in our region should have access to,” he said. Lopez told EGP the eastside environmental group has already started to put together a list of amenities they would like to see in their backyard. The group is advocating for more green space, pedestrian bridges, bike routes, parks and access to water for recreational use such as kayaking that would provide “real benefits for these communities,” he said. “The north portion has access to more water, we don’t have that option,” Alvarez said. Ultimately, Rendon hopes the bill will lead to a riverbed that is not covered in graffiti or a magnet for drug use and homeless encampments. “It’s not just about green space lots, it’s about maintaining the river and cleaning it,” Alvarez clarified. Rendon’s legislation has received support from elected officials and organizations in the Southeast communities, as well as County Supervisor Hilda Solis, Congresswoman Lucille Roybal-Allard and the Los Angeles Conservation Core. Congresistas Piden Restaurar el Río de L.A.
Más de una docena de miembros del Congreso que representan distritos del sur están instando al presidente Barack Obama para financiar la fase de planificación y diseño de un proyecto de restauración de $1 billón para el Río de Los Ángeles, dijo el lunes el Rep. Xavier Becerra. El Army Corps of Engineers está recomendando que el Congreso apruebe esa cantidad para el cambio de imagen de 11 millas del Río de Los Ángeles que se ampliaría el río, restauraría los humedales y crearía parques y caminos para bicicletas. Alrededor de la mitad del costo del proyecto vendría del gobierno federal, con la otra mitad de fuentes locales. El proyecto de restauración afectaría a una zona del río que pasa por la “segunda región urbana más grande de la nación y las comunidades históricamente marginadas … que carecen de acceso a los espacios abiertos naturales y recreación al aire libre”, y crearía “cerca de 17.000 puestos de trabajo generando $4,68 billones en ingresos laborales”, según la carta de los legisladores que data del 21 de noviembre. Al comprometer los recursos necesarios para mover el proyecto de Restauración de Ecosistemas del Río Los Ángeles del concepto a la acción, podemos revitalizar nuestras comunidades locales, construir nuevos espacios públicos, crear oportunidades de recreación, proteger los ecosistemas naturales, mejorar la salud pública, e impulsar nuestra economía regional”, dice la carta. Las agencias locales han acordado proporcionar $590 millones al proyecto de $1 billón, de acuerdo con la delegación. Becerra se unió en la firma de la carta por sus compañeros Reps. Lucille Roybal-Allard, Karen Bass, Julia Brownley Tony Cárdenas, Judy Chu, Janice Hahn, Alan S. Lowenthal, Linda T. Sánchez, Adam Schiff, Brad Sherman, Maxine Waters y Henry A. Waxman. La mayor parte de los 51 kilómetros de largo del río de Los Ángeles, que se extiende desde el Valle de San Fernando hasta el Océano Pacífico en Long Beach, fue pavimentado y convertido en un canal de inundación hormigón durante la primera mitad del siglo pasado. Mientras que el canal prevenía que el río se desbordara, la transformación destruyó gran parte del hábitat para las aves, anfibios y otros animales salvajes a su alrededor. El plan de restauración intentaría revertir el daño al reintroducir campas de la hábitat natural a lo largo de la vía acuática.